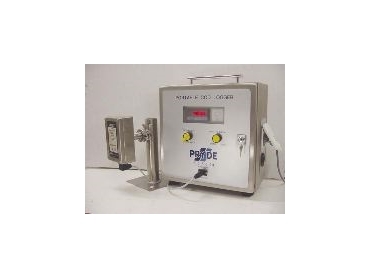 PRYDE Measurement's portable COD logger (chemical oxygen demand), 4-channel data logger can be rapidly and flexibly utilised to measure, log and retransmit COD in a wide variety of situations. With built in flow data handling, these flexible loggers are ideal for critical process monitoring including waste outlets, activating divert systems, detailing accidental spills, providing alarm functions and recording lost product. This COD Logger eliminates samplers with immediate on-line results. Twenty four/seven (24/7) real time environmental sensor data can be retransmitted and/or logged in Windows compatible storage for future analysis. When fitted with the optional battery pack, seven day stand alone remote date logging is provided. These units come in a rugged IP65 stainless steel case, are provided with 10 metres of weatherproof cabling and provide 24 volt dc power for flow and analyser sensors. Set up time at remote sites is rapid; even without laboratory support. From field setup to spreadsheet can be a "one man operation". Pryde Measurement provides complete support including extensive sensor and probe options, pipe insertion saddles, waste pit insertion probes, and tri-clover process pipe connections.